A seed stitch is made up of single knits and purls that alternate both horizontally and vertically. This stitch is considered so basic by some that patterns won't actually explain how to do it. 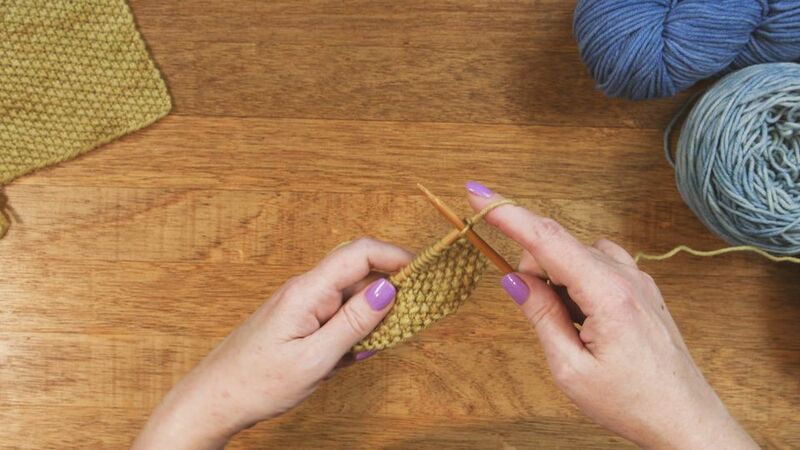 If you are new to knitting, you will soon master the even or odd seed stitch. When you're doing the seed stitch, just remember that the knits and purls never stack on each other. The little purl bumps that this technique creates look like seeds, which is the effect that gives this stitch its name. This stitch is an excellent choice of stitching for any item that you'll see both sides of the finished product, such as a scarf, because it looks the same on both sides. What is a bump on one side is a valley on the other, and vice versa. The stitch also lays flat, so it's ideal for the borders of sweaters or cuffs. However, some knitters find switching between knitting and purling for every stitch a little tedious. Row 1: Knit 1, purl 1, repeat to final stitch and end with knit 1. Rows 2 and beyond: Repeat the same pattern for the remaining rows. The seed stitch is similar to a moss stitch, which can make it confusing as to which you should use in a project. Both follow the pattern of knit 1, purl 1 in a row alternating with purl 1, knit 1 in another row. However, the moss stitch calls to knit 1, purl 1 for two rows and then to purl 1, knit 1 for two rows. In the end, the seed stitch has single knits that are on top of single purls, while moss stitches look a bit like ribbing that continually shifts over one stitch. Additionally, moss stitches are only used for even-numbered rows, while seed stitches can be used on either even or odd rows. Baby hat: This particular hat is stretchy, so it will fit a baby of any size. It makes for a labor-of-love baby shower gift. Washcloth: A simple project like a washcloth allows you to practice the stitch while making a useful item. This pattern is done in moss stitch. GAPtastic cowl: This Ravelry pattern produces a great basic, big cowl worked in chunky yarn in the round. Baby booties: These are simple, worked flat warmers for a little one's feet, but the seed stitch makes them a little more interesting and fun to knit. Men's hat: Compile Yarns uses two-color seed stitch for a fun beret. Hand warmers: Try out easy columns of twisted stitches on this project. Jacket: Keep this basic item in your clothing to shrug on when it's chilly outside. Neck warmer: Keep yourself warm with a homemade piece of clothing.